Summary: Some areas of the road are more dangerous than others. One of them is construction zones, which frequently close lanes, have different traffic laws, and present a variety of hazards. The good news is that you can get through these stretches of the road safely as long as you adhere to a few basic guidelines. Slowing down will significantly increase your safety in construction zones. The reason is that low speeds give you more reaction time, which will allow you to make evasive maneuvers when necessary. Additionally, even if you do get into a collision, a lack of velocity should lessen the severity of the impact and subsequent damage. Most construction sites have a variety of signs to help you navigate them. The most common of them include indicators of the start of the zone, the speed you should travel at, and whether or not lanes are closed ahead. Try to resist distraction while driving so you see these signs. Once you do, read them and follow their directions carefully. While some zones have signs only, others have workers directing traffic. This is especially true when the site closes down lanes. Whether these traffic directors tell you to slow down, stop, or proceed slowly, adhering to their advice is a smart strategy. Doing to opposite can lead to both traffic tickets and crashes. If a lane is closed, you may have to merge into another. Additionally, you might have cars changing lanes into yours. No matter what, be respectful and responsible while merging. That means using your turn signals, not being too aggressive, and letting drivers into your lane when appropriate. Cars tend to stop suddenly around construction zones. Two typical reasons why are lane closures and workers stopping traffic entirely. No matter what the cause is, you don’t want to rear-end the person in front of you. The best way to avoid that result is increasing your following distance, so you have time to react and stop. Lastly, do your best to stay calm. 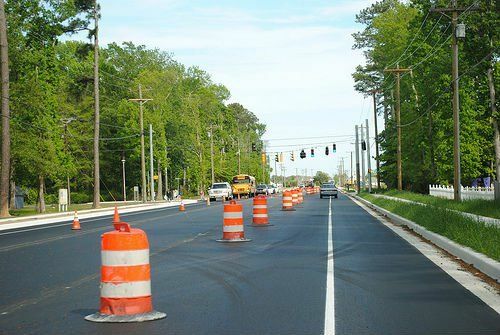 Construction zones often lead to slowing down and difficult merging situations, both of which can be frustrating. The truth is that getting angry can only hurt you. While the methods for doing so will vary from person to person, we’re sure that you have some strategies that help you manage your emotions. If you ever experience a collision in a construction zone, you’ll likely want to talk to a St. Louis car accident lawyer. One of the first things that professional will do is assess liability. What is so complicated about these types of crashes is that you, the other driver, and the construction team could be at fault. This complexity makes legal counsel incredibly important, so don’t hesitate to set up a consultation after your crash.